Howard Stern's sidekick of many years and former nurse Robin Quivers is convinced that changing to a vegan lifestyle saved her life. Continuously complaining of aches and pains all throughout her body, Quivers's path to veganism had many twists and turns, but ultimately she discovered that all of her symptoms went away when she eliminated animal products from her diet. 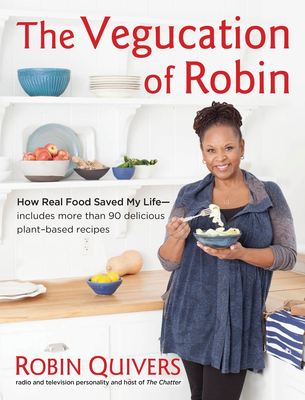 Half of this book is Robin sharing her story of why veganism is such an important lifestyle choice and the other half are the plant-based recipes she shares with her readers. Out of the all celebrity vegan cookbooks out there, I will say that this one has the most appetizing recipes. Dishes like purple potato salad with whole grain mustard, ginger miso kale, and red lentil daal make me actually want to try some of these recipes rather than turn my nose at them. One of the ways Robin entices readers in her recipes is by the cooking techniques she uses to bring out the wonderful flavors of the vegetables such as roasting or grilling. For the past few years I have been intrigued by the vegetarian and vegan lifestyle, but ultimately food just brings me too much joy to will myself into that sort of diet. However, if I were going to adopt a vegan lifestyle, the recipes in The Vegucation of Robin would probably be the first ones I'd go to. I think what is so appealing about these recipes is that Quivers doesn't use meat replacers like tofu and tempeh for her dishes, but rather, lets the grains and veggies be the star. While I am a little skeptical of some of Quivers's methods (she would frequently do a 21 day juice cleanse and not eat any food at all), I do respect the choice she made to be on a path to better health. The form of juice cleansing Quivers recommends now is not as extreme as her initial foray into cleanses, but hearing how she wouldn't eat food for weeks at a time made me wonder how much health advice I should be taking from her, former nurse or not. Real food made a difference for me, but I didn't have to give up any food groups to make it happen -- for which, I'm much relieved! I agree with you on the juice cleansing- 21 days is a little extreme. I am one of those vegetarians who never used the meat substitutes -the faux hot dogs, or the tempeh and tofu. I've always 'let the grains and veggies be the star.' Do you notice it isn't common anymore to read of vegetarians? It seems we are two extremes in terms of diet - avid meat eaters or vegans. Thanks for a great review. Nice to see someone in the medical profession thinking and writing about diet. I wonder why she left nursing. Yikes! 21 days? Regardless, any vegan or vegetarian cook that stays away from fake meat made from soy is bound to be a winner. I could never be full time vegan, although I will go without meat happily for awhile. The juice fast...no way, no that long. Ugh. I really doubt you can get enough calories from juice alone not to put your body into starvation, fat hoarding mode within three weeks. I hear you on the juice cleanses! But I don't care for tofu or tempeh, so this sounds like a decent cookbook option for simple vegetarian picks.